Class, Elegance and Dignity. Three words that epitomise not just the way he played the game, but the type of man Sandy Jardine was. A fantastic ambassador for Rangers both on and off the pitch, only John Greig and Dougie Gray made more appearances than Sandy's 674 competitive matches for the Club. A right-back ahead of his time, it is no exaggeration to say he was a truly world class player, and he got the chance to prove this in two World Cups. How did it come to pass that a young William Jardine, from a Hearts supporting family who lived only a hundred yards from Tynecastle, was to became the famous Sandy Jardine of the Rangers? As a 12 year old schoolboy training with his favourite club Hearts it's not difficult to imagine his disappointment when they told him that his future lay elsewhere. 'Elsewhere' turned out to be Ibrox. Young William's dad knew about his move to Rangers a lot sooner than he did, the news was kept from him and only when he reached his 15th birthday was he let into the secret! 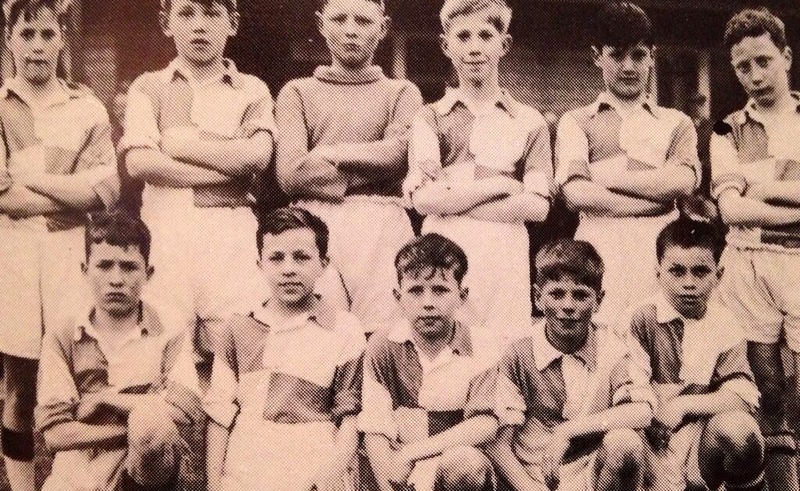 A young William Jardine with his school team. Travelling through on the train from Edinburgh to Ibrox with Rangers legends of the era such as John Greig, Jimmy Millar and Ralph Brand gave William ( as he was still known then ) a grounding in the Club. They taught him the 'Gospel according to Rangers' from their stories and words of advice. The most telling words of advice in those early days was to come from Scot Symon, who informed a 'tie-less' Mr. Jardine on his first day at Ibrox in 1964 that his dress standards must improve now that he was a Ranger! Entrusted with no greater responsibility than cleaning the boots of the players he travelled with, he quietly learned his football with the Rangers third team, for whom he occasionally played at left back. Versatility was a quality he showed from the beginning. Sandy and his twin brother in their school days. His twin spent a few months on trial with Rangers in late 60s. However, it was not at either of the full-back positions that Sandy Jardine played his trade in his early years at Ibrox. It would take nearly four seasons of first team football before he settled into the right-back position, the position he was to become internationally renowned for playing. His break into the Rangers First XI came the week after one of the worst results in the Club's history. Sammy Reid's historic winning goal for a Jock Wallace managed Berwick Rangers at Shielfield Park in the 1966/67 Scottish Cup forced Scot Symon to reshape his team. At right-half, 18 year old William Jardine was introduced to the Ibrox legions in a match against his boyhood heroes, Hearts, and helped Rangers restore the natural order with a 5-1 victory. His debut also cost him the princely sum of a crisp £1 note. Travelling companion John Greig had waged the £1 with the young Jardine that he would take his 1st XI bow before Christmas 1968. Sandy said it was impossible, took the bet, and paid up nearly two years before the bet expired! Retaining his place in the first XI for the rest of that season, the first of his 77 goals came at Somerset Park in his 7th game, his second goal, modestly described by himself as a 'real cracker' came in his first ever match versus Celtic, a 2-2 draw at Ibrox in the last league match of the season. His joy at that goal turned to despair, however, as only a few weeks later he was part of the team that lost in the Final of the 1967 European Cup Winners Cup to Bayern Munich by one goal to nil thanks to an extra time goal scored by Franz Roth. Of course, he would taste success in the same tournament five years later. It was around then that William, a first team regular in midfield, was to become known as Sandy. His Testimonial Program attributes this to trainer Davie Kinnear, who called him that on account of the colour of his hair. 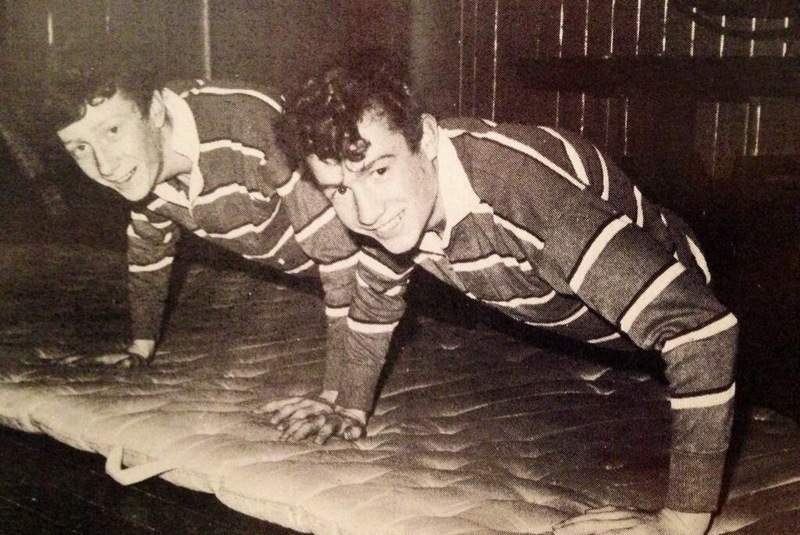 Young William had become Sandy Jardine of the Rangers. At the start of the 1968/69 season, on the instructions of new Rangers manager David White, Sandy found himself playing centre forward! He scored 13 goals in 12 matches playing up front before being dislodged from the striker position by Rangers record new signing from Dunfermline, Alex Ferguson! When Willie Waddell took over from White towards the end of the 1969/70 season, he wondered how best to use Sandy's undoubted ability to best effect. He was moved to right-back. A huge step back on the park was a huge step forward in the making of Sandy Jardine as a player. He was a natural right-back. A reliable tackler with attacking instincts and armed with the skill to get past opponents, he became one of the first exponents of the overlapping full back role. 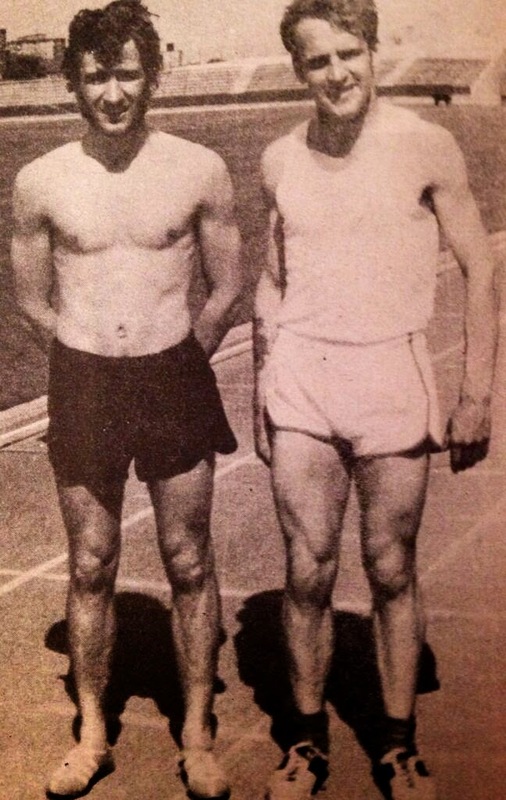 To improve his pace and prowess on his forays up the park from his defensive role, he was despatched to Edinburgh for specialised training under sprint coach and British Professional Mile Champion Jimmy Gray, who not only made him a better footballer but fashioned him into a speed ace who would go on to win prizes in professional races in the Scottish Borders circuit. Sandy with Sprint Coach Jimmy Gray. He won his first major trophy in October 1970 in the 1-0 defeat of Celtic in the League Cup Final, and it was in the following month he made his first gained the first of his 38 Caps for Scotland, coming on as a substitute for Davie Hay against Denmark at Hampden. His first international start came one year later in October 1971 in a European Championship Qualifier against Portugal. He marked the great Eusebio out of the game and Scotland won 2-1. That was the beginning of what was to be a remarkable spell for Jardine. On 19th April 1972 he scored a sensational, crucial goal in the European Cup-Winners Cup semi-final against Bayern Munich. A week later, on 27th April he started a run of 171 consecutive appearances for the Club, which continued for over 3 years until 30th August 1975, speaking volumes about his outstanding ability and fitness. Barcelona, 24th May 1972 was arguably the finest moment in his illustrious career, playing in every match on the way to European Cup-Winners Cup glory against Moscow Dynamo. He won a Scottish Cup winners medal the following year and in 1974 he was selected for Scotland's squad for the World Cup in Germany. After the tournament, Jardine and Danny McGrain were spoken of as the best full back pairing in the competition. An ever-present in the ECWC path to glory. Back on the domestic scene, the next season saw Rangers take the League Title for the first time in 11 years. Jardine was an ever present, scoring nine goals in 34 League games in a season that culminated that stopping Celtic reach 10 in a Row at Easter Road. He Captained the side that day when Colin Stein's bullet header got Rangers the point required to become Champions, although he did miss a Penalty! Captain for the day Jardine carries John Greig aloft on winning first title in 11 years. There was even more success to come. Two Trebles in 3 years ( 1975/76 and 1977/78) was a momentous achievement, , especially when you consider that we have won only 7 Trebles in total. The Trophy haul of these Trebles included two League Cup Final wins over Celtic and Scottish Cup Finals wins over Hearts and Aberdeen. So much of an influence was Sandy Jardine in season 1975/76 that he was voted the Scottish Football Writers Player of the Year. At the start of the 1979/80 season he scored what he considers to be the best goal of his career. The Dryborough Cup Final against Celtic is best remembered for Davie Cooper's wonderful goal, however Sandy Jardine's goal is a standout in it's own right. Winning the ball on the edge of the Rangers penalty box, he ran the length of the pitch before beating a couple of defenders at the edge of Celtic's penalty box and lashing the ball into the Celtic net. Age was catching up with the team that won those two trebles, and their time at the top was nearing the end. However, not before two further winners medals were added to the impressive haul of Sandy Jardine. A 1981 Scottish Cup Final victory over Dundee Utd. and a League Cup Final win over the same opponents later that year were the final winners medals he collected. His Role of Honour as a Ranger read - 3 League Titles, 5 Scottish Cups, 5 League Cups and a European Cup Winners Cup. His final season as a Rangers player was 1981/82. At the age of 34, he once again played in every league match before being released at the end of the season to join Hearts. He was offered a contract at Rangers which he considered unacceptable, and in the swan song of his career, a move back east awaited him. He might have joined Rangers a Hearts fan, but his 18 years at Ibrox meant he was now joining Hearts as a Rangers fan. Despite being into his late thirties, his time at Hearts could certainly be described as somewhat of an Indian Summer. At the age of 37 in Season 1985/86, he was once again voted Player of the Year, an amazing 11 years after his first Player of the Year award. A certain Mr. Alistair Murdoch McCoist finished that season as the League's top goalscorer with 24 goals, but it was testament to Jardine's ability & fitness, that playing as a Sweeper for Hearts he scooped the award. On his return to Ibrox after a spell as assistant manager at Hearts to another Rangers legend, Alex MacDonald, he arguably played just as important a role off the field as he did on it. A role in the commercial department quickly turned into a player liaison role. It was Sandy Jardine who became the first point of contact for any new player arriving at the Club. Well aware of the tradition and the history of the Club and mindful of the standards imposed on him on his first day at Ibrox by Scot Symon, it was Sandy who made new arrivals aware of what playing for Rangers meant. 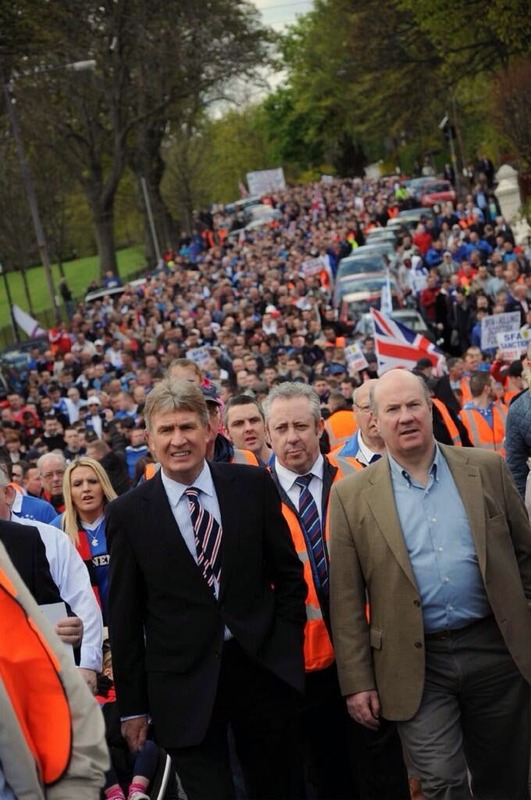 Sandy Jardine leading 10,000 Bears on a march to Hampden. He stood up for the Rangers employees when their jobs were under threat during administration. He had a keen interest in the history of the Club and protected it fiercely whilst others tried to take it from us. He looked after the memorabilia and the Club's archives, which for so long had been neglected, and which we as fans so dearly cherish. It was Sandy who placed an item from each Rangers manager in the managers office at the top of the marble staircase, including Bill Struth's typewriter. He was instrumental in setting up the Rangers Hall of Fame and was also on the board of the Rangers Youth Development Fund. In the immediate aftermath of Administration in 2012, when Ibrox had been deserted by Craig Whyte and his ilk, Sandy Jardine took on the role of being Rangers. 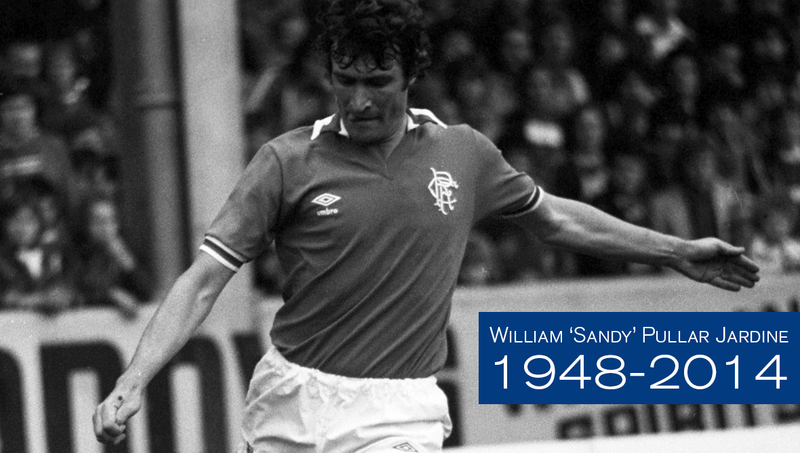 With no administrators to fend off the whole of Scottish football baying for blood, Sandy fought for the Blue corner. He was key to setting up the Rangers Fans Fighting Fund and was never afraid to be the face and voice of Rangers when every Tim, Dolly and Harry were having a kick at us when we were down. It was Sandy Jardine who took the anger and resentment of the Rangers fans toward the SFA into the streets, calmed the Bears down and then marched at the head of an astonishing 10,000 strong parade to the steps of Hampden for a peaceful protest. It was Sandy Jardine who stood on those steps and demanded justice for Rangers fans. He may have been the greatest Rangers defender on the park during his playing days, but he has certainly been Rangers greatest defender off the park in recent years. 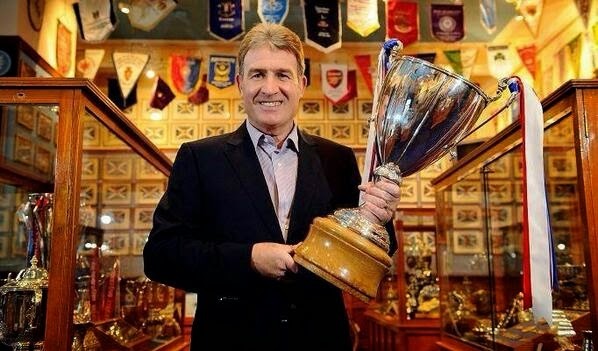 Since 2012, along with one or two others, Sandy Jardine has been Rangers. He has been at the Club during good times and bad times, from the Ibrox disaster of 1971 to Barcelona in 1972, Treble Triumphs and the present day shambles. Never once did he let the Rangers down. He recently said that he would like to be remembered as a 'Ranger Forever'. Sandy, you're immortal down Ibrox way. Thanks Gary. That was a great read with many snippets I wasn't aware of. Thanks Paul, glad you enjoyed it & cheers for the feedback. A fine tribute to Sandy, but a few inaccuracies here and there in the story. It was indeed Davie Kinnear who coined the name Sandy, but it was because of Sandy's running style, not his hair colour. Davie felt Sandy had such a slow and ponderous running style that it was as if he were running through sand. If that were true, then Sandy certainly responded to the criticism by becoming a very fast and direct runner. In season 1968-69 it was the signing of Colin Stein which displaced Sandy as Rangers' centre forward. Alex Ferguson was already at Ibrox. I'm not sure if Fergie was injured at the time, but Sandy was certainly being selected ahead of him as centre forward.